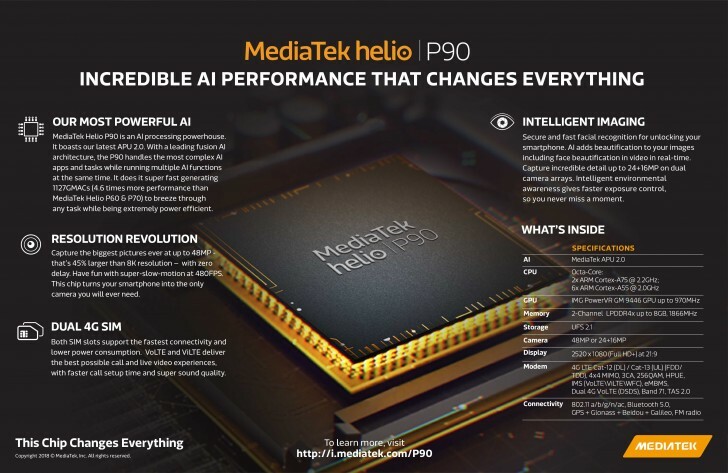 Less than two months after the Helio P70 introduction, MediaTek launched the successor Helio P90 with better AI and even faster CPU. The new SoC comes with Google Lens and ARCore support, as well as a second generation of the MediaTek APU for more accurate AI. It is built on the TSMC 12 nm FinFET process and should hit devices in Q1 2019. All the key power units are improved, compared to the Helio P70 predecessor. While the CPU cluster is different and aimed at better power optimization, the camera capabilities have improved significantly. While a 48 MP camera sensor in a midranger is highly unlikely, TL Lee, General Manager at MediaTek, said that the important updates are the support for 480 fps slow-mo videos and triple ISP for RAW images and better AI shots in a low-light environment. The GPU is completely new in the Helio P90 - IMG PowerVR GM9446 at 970 MHz that should bring 15% improvement over the Mali-G72 MP3 used in the Helio P60 and Helio P70. The new platform implements AR and MR acceleration, while developers can introduce applications using common frameworks such as TensorFlow, TF Lite, Caffe and Caffe2, based on MediaTek’s NeuroPilot SDK, thanks to the partnership between the chipset company and Google. Connectivity-wise nothing has really changed - Category 12 down speed with 4x4 MIMO, dual 4G VoLTE, but Bluetooth has evolved to 5.0 and now all Wi-Fi standards are compatible. Production of the chipset has already begun with the first Helio P90-powered smartphones expected to arrive in the first quarter of 2019. 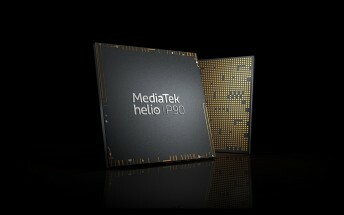 In the meantime, Mediatek will push updates to devices on Helio P60 and Helio P70 with Google Lens and ARCore support, with a final release expected before the end of the year.